There are some weird ins-and-outs about the program, but because of it, the way I’m going to roll out shirts is going to be a little different. It actually might make it better anyway this way, but whatever. Let me get right to it! 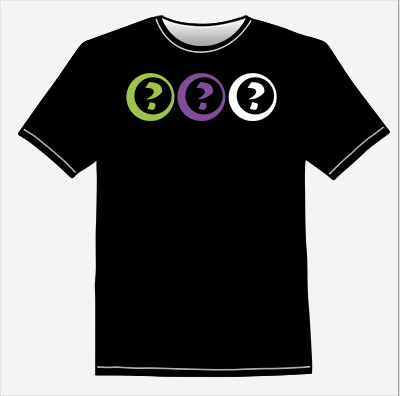 Today I (re)present you with the best-selling Tri-Rune t-shirt! It was the first shirt I made available via Teespring a couple of years ago. A good number of you bought it then. So if you missed out on that limited run sale or you want another one, now’s your chance. The cool thing now is you can buy it whenever you want. If you don’t want another Tri-Rune shirt or you don’t like it or whatever, then don’t fret. Today I’m also revealing a new design that cool kids will recognize. If you’re not cool, then I’ll tell you what it is: it’s inspired by the Super Nintendo logo. So those look cool, right? You know what’s even cooler? With Amazon, I’m able to sell these at a much cheaper cost. They’re only $15! I think with Teespring, you were having to pay close to $25 with shipping. But yeah, these shirts are on Amazon, so if you have Amazon Prime, you get free shipping, and it’s also easy to add these to your cart and get them delivered right away. I will say that I haven’t bought samples of these shirts yet, so I can’t speak to the quality, but I doubt Amazon would even allow crap shirts to be used. They are available in men’s, women’s, and youth sizes. Eventually I’ll add these (and more in the future) items to robbysuave.com, but for now just click the pictures above, search for them on Amazon, or follow the links below.